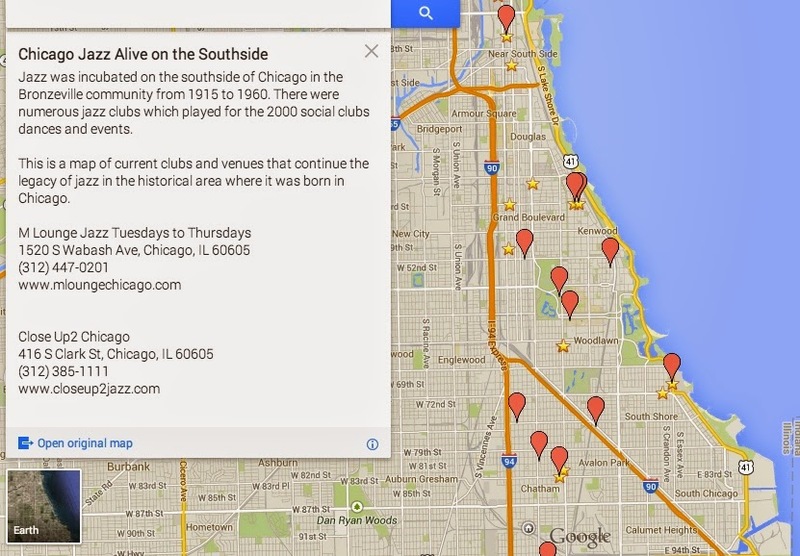 Hyde Park Jazz Society in Chicago preserves the history of jazz in Hyde Park. The Hyde Park Jazz Society (HPJS) promotes jazz performances in the Hyde Park and mid Chicago South Side Community for jazz fans. It also develops and supports jazz musicians. There was a jazz club located on the University of Chicago campus named The Beehive during the 50's and 60's where famous jazz musicians performed with students in jazz jams. The Hyde Park Jazz Society Sunday Night Jazz Jams at Room 43 continue that legacy with students jazz musicians and accomplished jazz artists performing improvisational jazz music for eager jazz audiences. - TIME: 7:30 p.m. to 11:30 p.m.
side of the street (at the bus stop sign - it has orange awnings). The Hyde Park Jazz Society also hosts the Hyde Park Jazz Festival in partnership with the University of Chicago. Please check about article Jazzin Good Times at the Hyde Park Jazz Festival.